With the weather warming up again, the kids have been spending more time out on the balcony. So, I figured it would be nice for them to take a break from throwing stuff down to the neighbors 😉 and had them paint with ice cubes. I was debating whether to use paint or food coloring and boy am I glad I went with food coloring. If you have toddlers I think its best to stick with food coloring as there is a chance they will put it in their mouth. Making the ice cubes is fairly simple but does require you to prepare ahead of time. Mix water and food color in a measuring cup and fill each cube of an ice cube tray with one of the colored waters. Insert a stick into each cube to make the cubes easier to handle after freezing and freeze the ice cube tray. 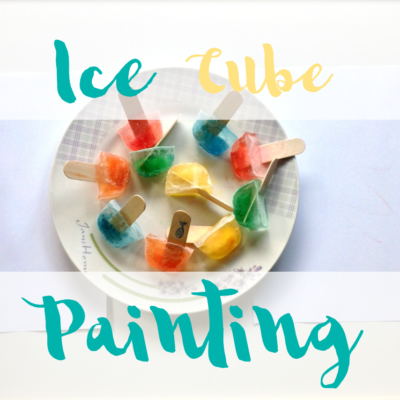 Pop out frozen colored cubes and let children paint on paper with the ice cubes.